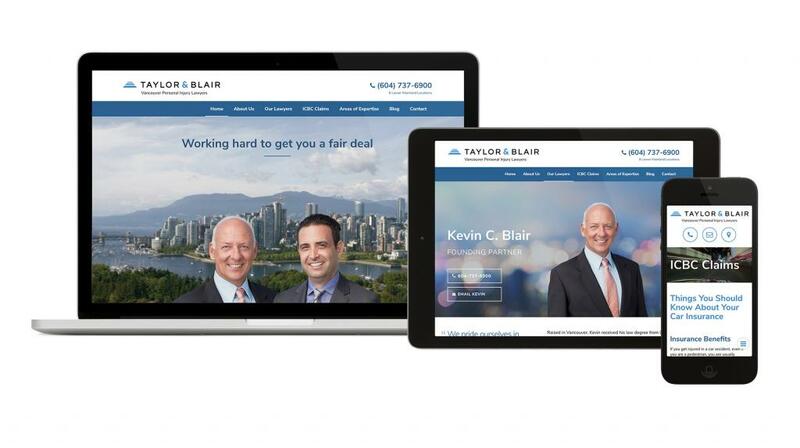 Taylor & Blair is a Vancouver-based personal injury law firm founded in 1993 by Graham Taylor and Kevin Blair. 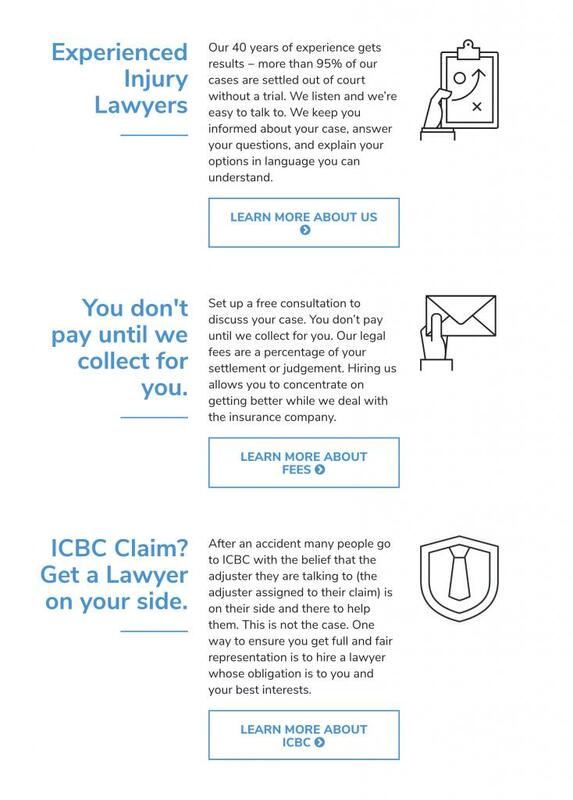 Skunkworks built the firm’s last website in 2006 and it served the firm well for over 10 years, or nearly a century in “web years.” The firm has 6 offices in the Lower Mainland, with most of their work relating to ICBC claims. Brian Jacobson became a partner at the firm in 2015 and it was time for a new coat of paint on their digital presence. 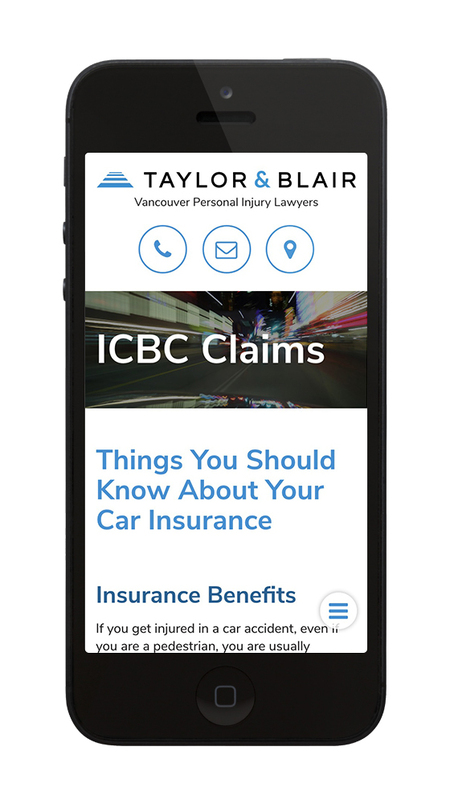 When the team at Taylor and Blair decided it was time to update their website, they asked for a fast, functional, mobile-friendly site that placed emphasis on their lawyers and the work they do. They wanted their new site to reflect Vancouver and to establish trust by putting their team front and center. They also wanted to avoid that stock-image, impersonal feel. We developed a site that focuses on the user experience and end goals without overwhelming or confusing the visitor. In Taylor & Blair’s case, the emphasis was on the calls-to-action (call, email, text, location). On every page, and specifically for mobile, this is displayed in a way that makes it easy for the user to find and act on the information they are seeking. The data on mobile browsing is now indisputable; we have officially entered an age where mobile usage is outpacing traditional computer usage. This meant ensuring the new site’s responsiveness to the user platform was key. One area in particular that makes a huge difference is background images. A growing trend in web design is a large featured background image. This won’t have the desired impact at various screen sizes if it doesn’t load quickly and correctly. We achieved this by customizing the images through CSS for each platform size. You may not be aware that fonts don’t actually exist on a visitor’s computer and have to be downloaded. The number of fonts and sizes add up quickly in terms of site speed. One way to make sure a site loads quickly and displays properly is to use Google Fonts which are cached so that they load fast without compromising user privacy. Images that are large can also slow a site down. The ideal image file type for icons, logos and non-complex images online are vector files. These are small files and look good on hi-def screens and monitors. Any sort of more complex images such as photographs should be PNG’s or JPEG’s, which often have a smaller size than GIF files but display great quality images. Modern design is somewhat subjective, many of us would agree modern these days means minimalism. The idea is that less is more, or according to Da Vinci: “Simplicity is the ultimate sophistication.” Minimalistic designs often contain a good amount of white space and avoid the overuse of images and buttons. They key is to have one unified feel across all pages. Often overlooked, but must not be forgotten is the copy when it comes to a modern website. To make the modern design effective, well-written copy that resonates with the user is key. People are now used to reading small snippets of text vs. long hard to read articles. Telling stories with images and prioritizing copy that is easy to read will keep a user more engaged over long paragraphs of legal jargon. Supporting this minimalist aesthetic, we added an introductory video to the new site where Kevin and Brian are given an opportunity to say hello. Video allows prospective clients to get to know the lawyers at the firm. When the walk into the firm’s office for the first time, they will feel like they’ve already met their lawyer. Please have a look at the new site at taylorandblair.com. We hope that it serves the firm well for many years to come.